Catering for all your washroom visitors’ needs is an important part of providing potential customers with a pleasant experience, especially for parents with young children. 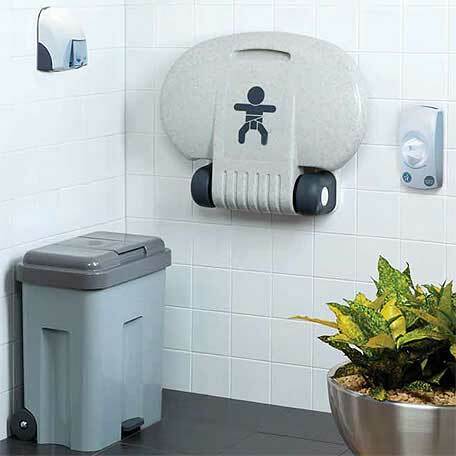 We can help you provide everything that a parent needs in your washroom, including a choice of safe, stylish and hygienic nappy bins in a variety of modern styles and sizes. Your business’ needs are our first priority and we’ll work with you to find the best service to meet your budget and requirements. Our services include our modern nappy waste bins with collection and disposal from CRB checked drivers, leaving you with a fresh and hygienic bin liner after each collection. Our experts are ready to answer any questions you might have and provide free, straight-talking advice about providing the most hygienic and pleasant experience in your washrooms. For a complete package to cater for parents, we can also provide nappy vending machines with installation, nappy bag dispensers and hand sanitizers. Get a quick quote today for a nappy bin service to meet your needs. We know that not all nappy disposal needs are the same. Which is why we offer two sizes of nappy units - the Maxi and the Maxi X. They're both designed to a high specification to ensure easy 'hands-free' usability, strong and durable, no leaks and a fresh, fragrant smell at all times. Disposing of your nappy waste is just part of what we do at Direct365. We also offer a complete package of nappy waste essentials, such as: Nappy Vending Machines, Nappy Bag Dispensers, Hand Sanitiser, Air Freshener and much more. For further information, ask one of our experienced Customer Service team for more details. We service a wide range of businesses from children's nurseries and play centres, through to family pubs, restaurants and churches. Our servicing schedules are available from weekly, fortnightly, and 4 weekly depending on your requirements. We will help you choose the right schedule for your business.